Detroit River Fishing Charter Directory. The Detroit River in Michigan on Lake St.Clair. During Fishing season on Lake St. Clair, Fishing charter captains provide fishing reports for the Detroit River. Fishing season begins when the ice is out, although many captains fish year round on the rivers tributaries. Charter captains begin taking reservations early in their season. Michigan Charter Boat Captains attend the outdoor sport shows. (see the Michigan Sport Show schedule). Your could even win a free fishing charter for 4 persons! Located between lakes Huron and LAKE ERIE, Lake St. Clair is the smallest lake in the Great Lakes system. Heart-shaped and shallow (averaging only 10 feet/3 meters deep), the lake requires periodic dredging to ensure bottom clearance for large ships. The Michigan portion of the delta has has an abundance of fishing recreational opportunities and is home to some of the largest Muskie in the Great Lakes System. 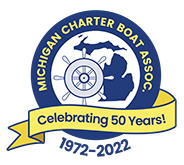 When choosing a Lake St. Clair Fishing Charter Captain always look for a member of the Michigan Charter Boat Association to be sure your captain complies with state and federal regulations.